The7 features full and seamless integration with WPBakery Page Builder (formerly Visual Composer) and Ultimate Addons. Most our buyers agree that The7 is the best theme to be used with these plugins, up to date! Its 1000+ Theme Options allows to craft almost any imaginable design. And Design Wizard feature lets you create a boutique-grade website design in mere minutes. Both Wizard and advanced Theme Options can work in visual WP Theme Customizer-like and old-school backend editing modes. 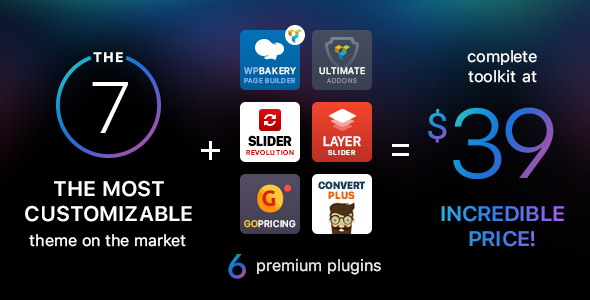 The7 comes bundled with WPBakery Page Builder (formerly Visual Composer), Ultimate Addons, Slider Revolution, Layer Slider, Go Pricing Tables and ConvertPlus. It is also fully compatible with most popular plugins like WooCommerce, WPML, Yoast SEO, All in One WP Migration, W3 Total Cache and many others.